The Union Cabinet chaired by Prime Minister Narendra Modi on Wednesday approved Rs 1,000-crore initial corpus for the Fund of Funds for Start-ups (FFS), which was established in June last year. According to the Cabinet decision, Alternate Investment Funds (AIFs) supported by FFS shall invest at least twice the amount of contribution received from FFS in start-ups. It was also decided that operating expenses for carrying out due diligence, legal and technical appraisals and convening meeting of Venture Capital Investment Committee, among others, would be met out of the FFS to the extent of 0.50 percent of the commitments made to AIFs. "This will be debited to the fund at the beginning of each half-year, i.e. April 1 and October 1," an official statement said here. 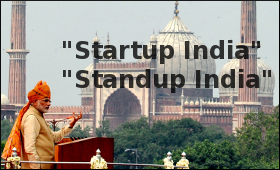 The Union Cabinet in its meeting held on June 22 last year had approved the proposal to establish a Fund of Funds for Start-ups (FFS) with a total corpus of Rs 10,000 crore, with contribution spread over the 14th and 15th Finance Commission cycles based on progress of implementation and availability of funds. It was decided that the FFS shall contribute to the corpus of AIFs for investing in equity and equity-linked instruments of various start-ups at early stage, seed stage and growth stages. The FFS is being managed and operated by the Small Industries Development Bank of India (SIDBI). It contributes to SEBI-registered AIFs that may go up to a maximum of 35 percent of the corpus of the AIF concerned.